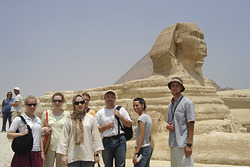 Learning the Lingo in Egypt! The best bits of the courses that I took were for me the very thorough drilling of sounds/letters, controlled oral practice ‘chains’ around the class, the slightly freer oral/aural pair work information gap activities we had from time to time, the use of visual aids to reinforce meaning, the use of very targeted task-based simple listening on audio CD, the very targeted letter recognition and copying exercises, and the relaxed concentration of trying to copy exactly the flowing pen strokes of my calligraphy teacher, Ahmed, who was a really neat and exact scribe. 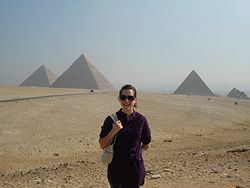 ‘Don’t cross the road unless you have life insurance’ – that was my sister’s piece of advice before I went to Cairo, and I soon realised that she wasn’t kidding! When I arrived, my airport transfer driver pulled out of the car-park and set off the wrong way down a one-way street. Amazingly, the locals are apparently unaware of their mortality and step out in front of the cars, inching their way ‘lane by lane’ across the road (the roads are far too busy for you to ever get all the way across in one go). That said, lane markings seem to be considered merely decorative – coming off the ring-road there were two lanes marked but there were five rows of cars trying to squeeze onto the slip road! The traffic in Cairo means that it is impossible to estimate how long it will take you to get somewhere. It is ‘rush hour’ all day long, with traffic jams everywhere. To get to the pyramids from the school, it can take you half an hour or it can take you over an hour – you have to adopt the Egyptian mentality and not worry about schedules!